Reflecting back on 2015, I am amazed at how many lessons a year brings. This year I have had a bit of a guide, a Page-A-Day calendar filled with daily inspiration (“Today Is Going to Be a Great Day.”). I posted some of my favorite images and messages on the Happy Healthy Her Facebook Page. Please give it a “like” if you haven’t already. Upon first reading the quote from Tennessee Williams, I questioned the concept. I have always been a passionate, even fiery person at times. 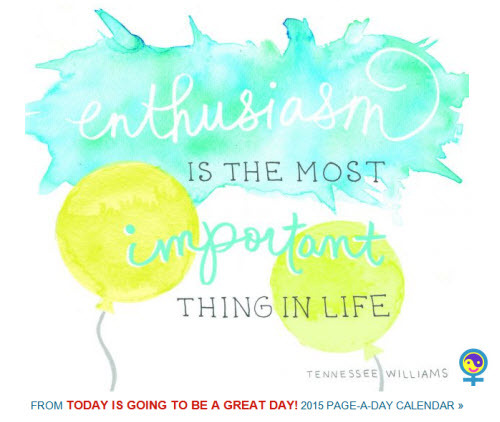 I am a Pitta dosha in terms of Ayurveda, so the idea of enthusiasm being important certainly resonates with me. But, the most important thing? I wasn’t so sure about that. I put the calendar pages that inspire me most in a keepsake box or on my vision board, but that one ended up in my “to do” pile because I just wasn’t quite sure how I felt about it yet. I previously wrote 41 Things that Matter, and passion did make the list. I followed that post with The Little Things, another exploration into what matters most in life with the emphasis being on the details, an aspect of enthusiasm perhaps. However, again, the idea of it being the most important element felt off to me. Besides, all this emphasis on “things” also gave me pause, because as one of my favorite sayings goes, “The best things in life aren’t things.” It is difficult to convey in words the value that feeling states like enthusiasm, wonder, or even love actually provide to life. That elusive, indescribable quality is likely what makes them so special. Olympic skating is arguably one of the most challenging and stressful sports. All the years and hours of practice all come down to landing the perfect jumps and twirls all on a tiny little blade. It is not hard to understand how enthusiasm for the sport is essential. I was definitely gaining more clarity. This Christmas I experienced the final piece of the puzzle on enthusiasm’s power. As my in-laws gathered to share presents, the energy from several of my nieces and nephews was palpable. My youngest nephew in particular was absolutely overflowing with enthusiasm. He had taken pictures of the gifts he had gotten from his parents and Santa (although he is now in sixth grade it is clear he still wants to still believe in Christmas magic), and he proudly shared with me the photos of the loot. Afterward he spontaneously broke into a happy dance. His excitement was so contagious that a feeling of total joy washed over me. With every gift he opened, the joy and love just kept spreading. By the end of the night, I was finally able to really understand what Tennessee Williams meant. Enthusiasm is at the heart of some of our most beautiful, positive emotions including joy, gratitude, and love, and for this reason, it may just be the most important thing. Here is to an Enthusiastic New Year! May 2016 bring you all you desire and more.